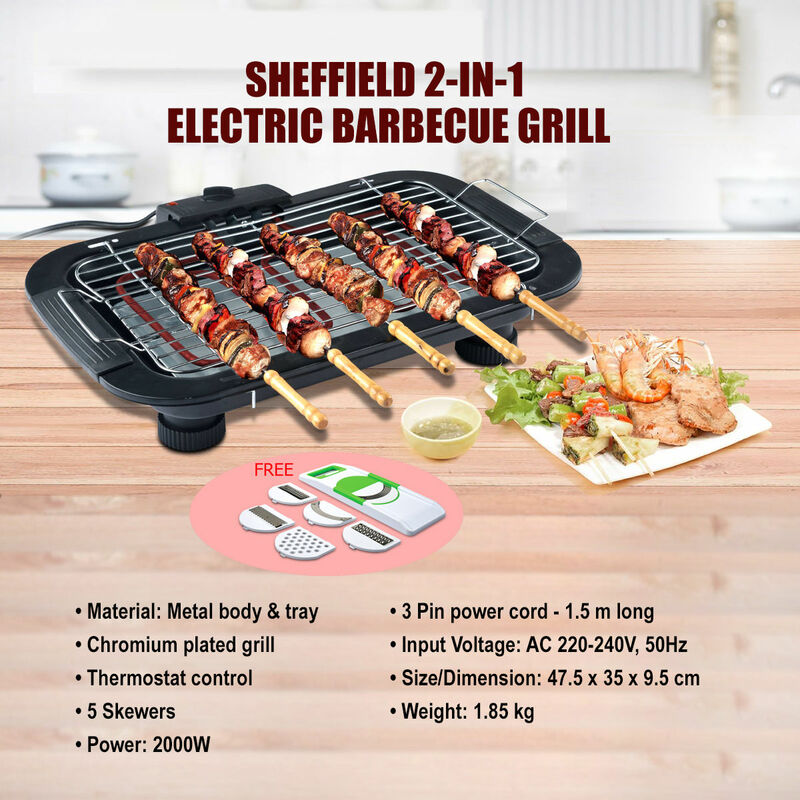 Portable to carry to picnics and outings with friends and family, the Sheffield 2-in-1 Electric Barbecue Grill is what the chef ordered. 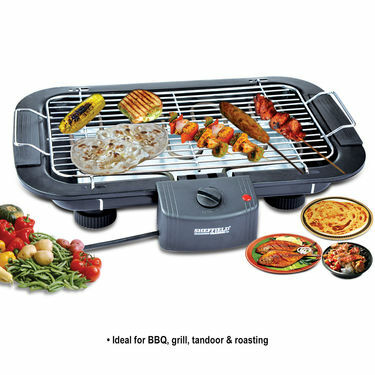 Enjoy healthy and delicious grilled food indoors o outdoors. Compact, it will take only a small part of the kitchen counter top space while adding to the decor. The cool touch handles let you move the grill around without accidental burns. Thermostat control ensures that your food is grilled succulently. 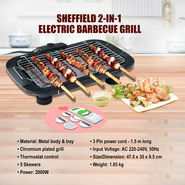 Switch on the barbecue & set required level of heat from the power nob given at the center of the barbecue. After food is cooked switch off the barbecue grill. 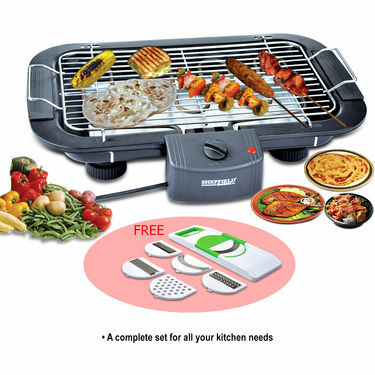 Enjoy delicious and succulent tandoori chicken, beef steak, shrimp, fish, and all kinds of veggies including asparagus, eggplant, mushrooms, potatoes, zucchini and many more in the Sheffield 2-in-1 Electric Barbecue Grill. It is provided with a tray and two grills. The adjustable thermostat control of the Sheffield 2-in-1 Electric Barbecue Grill ensures that you control the heating up of the product. 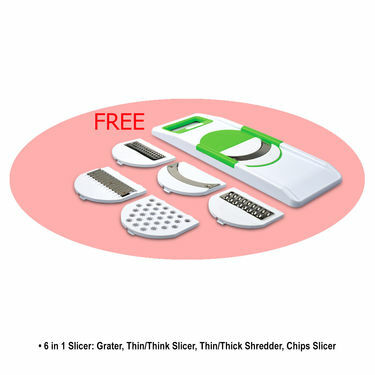 Therefore you no longer have to worry about burning food accidentally. 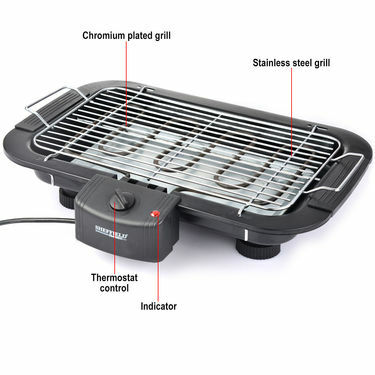 For added durability, the grill is chromium plated. The grill?s level can be adjusted according to the thing you will be grilling. The parts are detachable, allowing you easy cleaning and maintenance. 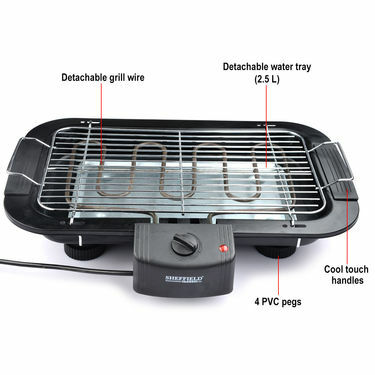 This electric grill is perfect for small outdoor areas such as balconies, terrace and patios. It consumes about 2000W of power with input of 220-240 VAC, 50 Hz which is good enough. 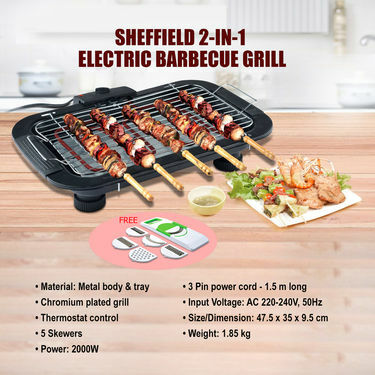 Sheffield 2-in-1 Electric Barbecu..VSSheffield Changeable Plate 2 in 1.. Sheffield 2-in-1 Electric Barbecu.. VS Sheffield Changeable Plate 2 in 1..
Sheffield 2-in-1 Electric Barbecu..VSSheffield Classic All in 1 Cookin.. Sheffield 2-in-1 Electric Barbecu.. VS Sheffield Classic All in 1 Cookin..
Sheffield 2-in-1 Electric Barbecu..VSColoured Roti and Khakra Maker + .. Sheffield 2-in-1 Electric Barbecu.. VS Coloured Roti and Khakra Maker + ..
Sheffield 2-in-1 Electric Barbecu..VSRoti Maker + 10 in 1 Food Process.. Sheffield 2-in-1 Electric Barbecu.. VS Roti Maker + 10 in 1 Food Process..